0 Comments Published by KL Ocs Kid on Monday, May 7, 2007 at 5:24 PM. 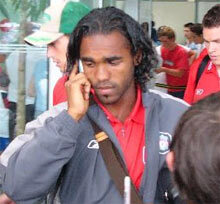 Recreativo Huelva, the Spanish side that took Florent Sinama Pongolle on loan, have completed the deal for the Frenchman - handing Liverpool €4 million (£2.7 million). Pongolle has had a superb season in the Spanish La Liga. The French striker arrived at Anfield under Gerard Houllier’s reign and alongside Le Tallec was believed to cost a joint £3 million. The figures declared by Recreativo indicate a small profit on Flo. Pongolle has been outspoken in some of his criticism of Liverpool and Benitez since his loan moves which also included Blackburn Rovers. The player was famously spotted wearing an Everton scarf and declaring that the ‘people’s team’ in Liverpool was… Everton. Excellent career move. We wish the player the best of luck at Recreativo, and Au Revoir.